Maxcap® double layer capacitors are a new electric energy storage device with extremely high volumetric efficiency (over five farads/in3), virtually unlimited service life, fast charge/discharge capability and very low leakage current. The Maxcap DLC “Standard Products” offer a wide range of product geometries and electrical characteristics from which to choose. The major design considerations in selecting a Maxcap DLC for a given application include the load characteristic, the allowable voltage drop, required backup time, and available board space. 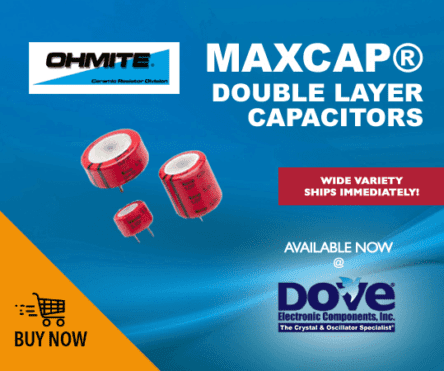 Wide variety of Maxcap® double layer capacitors are In-stock now at Dove Electronic Components.